Ginny's Kiwi Adventures: Went out to look at houses - came back with a car! Went out to look at houses - came back with a car! Today was a glorious spring-like day, hardly a cloud in the sky so the whole house warmed up!! I went out to look at a couple of furnished places but one was already let by the time I showed up and the second was nice but too close to downtown. So then I headed off to Turners Auctions where they auction used cars. It's a huge place and quite intimidating - definitely not your friendly neighbourhood shop! I looked at a few cars and then left. But while walking back to the bus depot, I passed about a hundred other car dealers and one of them just sucked me in. Maybe it was the name that did it - Lifestyle Autos. It was a small place and there was a woman salesperson who was very helpful. So before I knew it, I was driving home in my 1997 (3 years newer than my car in CA!) 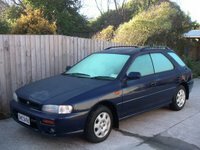 blue Subaru Impreza - freshly arrived from Japan with only 59,000 km on it. I managed to drive the whole way home on the left side of the road and I only turned on my windshield wipers once when trying to signal a turn. Not bad, eh? Ok. You're on this incredible adventure (to the antarctic practically/worm bins/no heat/wireless-less for awhile) and I can't even figure out the blog business to comment! Glad you got a car! Did you spend the weekend driving to a four star hotel? Hey Laurie, you've got to come and visit. It's awesome here!